Why do some items have negative refund rates? A ClickBank refund rate means how many customers out of 100 ask for a refund. 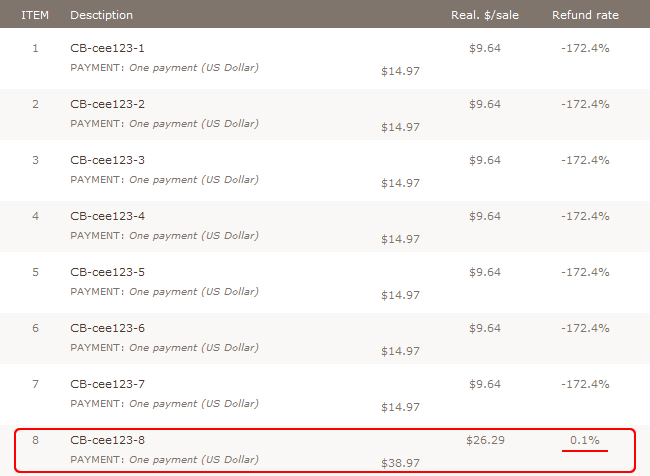 For example, if a ClickBank refund rate is 3%, it means that 3 out of 100 customers ask for a refund. What does a negative ClickBank refund rate mean? Fact is that every vendor may have up to 500 different items, such as different products, discounts, combinations of product, etc. But for every vendor ClickBank provides only the average Initial $/sale received by affiliates who sold any item of the vendor. ClickBank doesn't show the exact Initial $/sale values for each item of the vendor. So, it's just impossible to calculate refund rates of products of a vendor who sells lots of products or actively gives discounts! If you see negative or huge refund rates, just ignore them. However, a lot of vendors sell only one product and don't give discounts. Although they have created many items, they use only one. In such case, there will be a correct refund rate near to the main item. Here is how to find the main item. Maybe in the future ClickBank will provide stats for each item or even show actual refund rates, but nowadays we can only make estimations using the available data.